While swapping e-mails with Greg Spink from ValetPro, he asked if he could send me some sample products to review. "Tell us what you think - it will carry far more weight if a recommendation comes from you" he said, which is very flattering. We get samples all the time and it makes sense for me to review the ones that are available to the public. After all, we have tried most of them at one time or another and know eggs from eggs. We took delivery of a box which contained the basic kit you would need to do a basic wash'n'wax on a car, this pleased me greatly, not only because it was a very sensible selection to send, but I'm doing an article on how to do a basic wash and wax - so I can kill two birds with one stone. Long Life Car Polish - a wax which may or may not polish. The first thing that strikes me is that the bottles are the standard type of bottles you would expect trade products to come in, the labels are sensible and plain complete with description and health warning. Even the letter and the price list which came with the kit are no-nonsense - so don't expect flashy logos and pictures of glossy looking Italian sports cars! I don't know how the general public feel about this but you can be certain that we in the trade are never won over by fancy packaging and wild claims - so often the packaging is much better than the product. It's a pet hate of mine! The second thing that strikes me is that they smell like proper gear! This probably doesn't mean a lot and most people would think they just smell like chemicals (no banana or coconut fragrances I'm afraid) but they smell familiar which gives me a bit of confidence in them. It's not just the smell which is familiar - the glass polish seems very similar to what we currently use at Clean Image. As I already mentioned, I had been planning to do an article on 'how to wash your car' and so that I could have some nice pictures illustrating the points, I had made sure my 10 year old white Golf GTD was good and dirty... unfortunately there was a problem with the camera meaning none of the photos actually came out... but take my word for it, the wheels and bottom half of the car were black! However, this dirt and grime was no problem for the Alloy wheel cleaner - it has a citrus type smell and I think it is probably very similar to various products that have become hugely popular amongst enthusiasts in the last year. The Alloy Wheel Cleaner cut through all the loose brake dust and grim and much of the metal fallout. As my front wheel had quite a bit of fallout on them I had to clean the a couple of times and I left the cleaner on for quite a long time... but despite this, there was no staining or tarnishing on my rather old alloys. And lets face it, older wheel are most prone to tarnishing from wheel cleaners. The Wash & Protect also had no problems cutting through all the dirt, better still it really did leave the car looking quite glossy. It made the black plastics and rubbers look many years younger. This is without a doubt a very good quality product - but a good quality wash-and-wax is often overlooked by people making out shopping lists of products. Some people like to apply expensive waxes and don't like to do so over other waxes, or they feel that as they are going to polish the car after washing that wax from wash & wax is a waste of time. But as wash and wax will add a sheen to plastics and rubbers, like a discreet dressing, it provides a very good starting point. However, I didn't use the Long Life Car Polish over the top as I wanted to see how long the wash and wax lasted - after two weeks of hot sun and summer storms my car still looked pretty glossy. My only problem with the Long Life Car Polish is that it is called a 'Polish' and as far as I can tell it contains no abrasives, so it should more accurately be called a wax? I called on Gary's help to review this product as he has over had 20 years experience with various waxes. We selected a suitably dark car, and after doing that we did a couple more. His first act was to take the top off the bottle and take a sniff, "Oh yes, I can already tell this is good stuff" he said. And it was good stuff, it went on easy and came off easy, it dried quick and was very quick to use. It didn't cause lots of dust like some products do, no streaks or residue, and left a really good shine on light and dark cars... You really can't fault this wax. It's absolutely perfect for professional use and for average car owners who don't want to mess around with expensive paste waxes. The Window Polish was a very pleasant surprise because it's actually a polish, in as much that it looks much like the kind of polish you would put on your paintwork. At Clean Image we use a very similar product and at first thought it was the same. It isn't but works just as well - it's very good stuff. There is a bit of a knack to using these polishes and I'll let you in on the secret. As with any polish, you need an applicator and a polish-off cloth. After washing clean the windows, inside and out, to get the worst of the dirt off (as you should do with any kind of glass cleaners which are good for removing streaks, but when it comes to removing dirt and traffic films you really need to use a leather or damp microfibre to wipe them clean first, getting right up into all the corners.) you pour some of the polish onto your applicator and apply it to the centre area of the window, but leaving about an inch gap between the rubbers. You can then use a microfibre cloth to remove it, but wipe the cloth right up to the rubbers. The excess polish that is on your cloth will be enough to clean the inch gap, this method means you won't get it all over the rubbers and plastic. Long Life Tyre Dressing was used to finish off my car - it made the tyres black - what more can you expect from a tyre dressing? Some people like tyre dressings to give a wet look gloss, namely Gary! But the rest of us at clean image prefer a satin finish so the tyres don't actually look like they have been dressed, they just look new. And so we were very happy with this dressing. We like to apply tyre dressings by brush or with a sponge, this way you don't get spray in the air which ends up all down your freshly waxed paintwork. It also means that you can better control how much dressing goes on the tyre - if you apply too much it won't dry before you drive off, and then it will splatter everywhere. The dressing didn't wash off at the first sign of rain and it kept my tyres black and new looking for several weeks. They had been a bit brown before applying the dressing and even now the discolouration has not come back. These are the core products that most valet companies would want to purchase and it's important to get them right or customers will go elsewhere. We believe that ValetPro has got these products right. As far as quality goes, you really couldn't ask more! But that's not all! The prices are very competitive and postage is only £5.99 - on order over £50, postage is free. ValetPro also does a sample pack of all 20 products in the range in 1ltr bottles for just £60 with free postage. This kit would make a perfect gift for the man who has everything! The products we have tried give great results and are very easy to use, making them perfect for non-professional use. And lets face it, they are far better value for money than many brand name products. The web site is clean, simple and easy to navigate, but at time of writing doesn't have a shopping cart system (due September 2005), but don't let that put you off - give them a try! Greg Spink is available by phone and is a very nice chap, willing to help and offer advice. They also have a quality guarantee that if you are not 100% satisfied they will give you a full refund. As Greg says, " Valet PRO putting our money where our mouth is"
The bottom line is that if we hadn't already got a supplier (of very similar products) that I'm related too, we would happily buy all our gear from ValetPro... and I don't think that's a recommendation I will be making in many reviews. I have to give ValetPro's products top marks! Additional comments by Clean Image Staff. "There are so many good ones on the market now that are new releases. But this is similar to a product I used to use years ago. It hasn't really been beaten. Some products go on easy and come off hard, some go on hard and come off easy - this doesn't excel in either by is a good all-rounder, it has got the balance right. The finish is very, very good. " "This is very good stuff, without a doubt one of the best trade products you can get." "I prefer this to the one we are currently using." 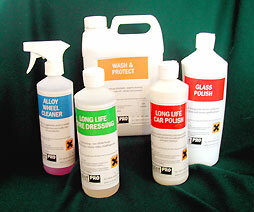 Offer a full range of professional quality valeting products for both trade and retail. Satisfaction is guaranteed with full refund promised if not fully satisfied. I have to give ValetPro top marks! Who takes responsibility for the devaluation on your leased car?